HMS "Leopard" (right) fires upon the USS "Chesapeake" in 1807. The event, now known as the Chesapeake–Leopard Affair, angered the American populace and government and was a precipitating factor that led to the War of 1812. As far as wars go, the War of 1812 doesn’t rank up there with the Revolutionary War or either of the World Wars. However, it did have important consequences for the United States, the colonies of Canada, and the fragile Indian confederation. The War of 1812, or the “second war of independence,” as it is sometimes called, was a military conflict between the United States and Great Britain that started in 1812 and ended in 1815. The main trigger of the conflict was Britain’s implementation of a maritime policy that affected American trade. Moreover, Americans had accumulated a lot of anger and frustration against Britain because of the country’s practice of impressment from American ships and its support for the Indian tribes in the American northwest. The United States also saw the war as an opportunity to finally take possession of Canada and Florida and increase the security of the country by establishing natural boundaries. The war of 1812 was fought both on land and at sea. On land, most of the American attempts to invade Canada failed, but the American forces managed to win several important battles. One of the key events of the war was the burning of the American capital, Washington, by the British. At sea, Americans were successful during the first year of the war, but the superiority of their vessels proved worthless when the Royal Navy implemented a blockade, impeding American ships to come out at sea. The financial costs of the war were a heavy burden for both belligerents, which prompted the termination of the war. The Treaty of Ghent was signed on December 24, 1814, but the conflict continued on the battlefield where the news about the treaty arrived late. In January 1815, the British forces were defeated at the Battle of New Orleans, and the war ended on a glorious note for the Americans. The peace treaty was ratified on February 17, 1815 at Washington, under the condition of status quo ante bellum (no boundary changes). Obtaining the independence was an outstanding victory for the United States, but as it was normal, the event caused an insurmountable rift between the United States and Great Britain and in the following years, the conflict escalated into a direct rivalry. After the American Revolution, the United States developed its merchant marine and entered direct commercial competition with Britain. There was also a conflict emerging on land as Americans became aware that the British in Canada were supporting the Indian tribes in their fight against the United States. Another cause of distress for Americans was the British practice of impressment. Under the pretense of reclaiming deserters from the Royal Navy or British citizens liable to naval service, the British often stopped American vessels and removed the suspected deserters, leaving the Americans ships without their crew. Moreover, along with British deserters, true American citizens were also victims of this practice, and not always by accident. The practice of impressment naturally caused a lot of frustration and anger in the United States. Moreover, Americans considered that people could become U.S. citizens despite being born elsewhere. Britain, on the other side, did not recognize a person’s right to change nationalities and considered all British born citizens liable for impressment. The relations between the two nations turned really sour when the British-French war started to affect the United States’ goal of maritime expansion. Especially after 1803, when the European War resurfaced with much greater animosity, the United States found itself in a weak position. The war consumed a lot of resources and Great Britain was in dire need of seamen, which forced it to increase its practice of impressment. American commerce suffered a severe blow when the British Orders in Council sabotaged American trade through its policies against neutral ships, which were not allowed to trade with France or any French dependency without passing firstly by an English port. Accepting Britain’s policy made American ships vulnerable to confiscation by the French navy. The United States got thus caught in a vicious circle, unable to continue its trade efforts on European soil. The American outrage reached its climax in 1807 when a widely publicized impressment action caused waves of indignation all throughout the country. 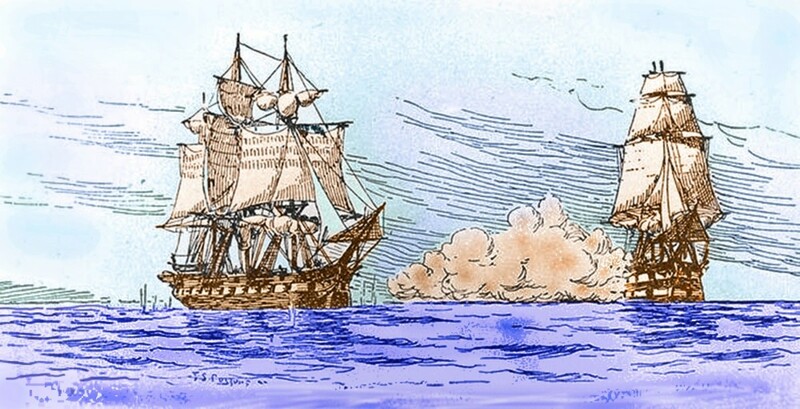 The British frigate Leopard fired on the American vessel Chesapeake and arrested four of its sailors, even though three of them were actually American citizens. Although war seemed inevitable at the moment, President Thomas Jefferson managed to suppress an escalation of the conflict, thinking that the United States was yet too weak for a war and that “peaceful coercion” could turn around British practices and policies. In December 1807, Jefferson proposed an Embargo Act to stop American overseas trade, hoping that this radical decision would force a change in European policy. Despite all the hope, the Embargo Act proved to be more detrimental to the United States than its European opponents. By 1810, talk about war became more common in some areas of the United States, such as the Mississippi Valley and the Southwest. The Northwest was also going through an agitated period due to constant clashes with the Indians, who had organized themselves into a loose confederation of tribes to fight American expansion with the aid of the British. Facing a growing economic crisis and frustrated for not being able to escape the British trade restrictions that left them with no market for their products, many Americans started to support the pro-war agenda. By the end of 1811, the war feeling had been fully revived and it was spreading rapidly all over the United States, supported by the war hawks, a group of young and ambitious men who had just taken their seats in the Twelfth Congress. During the 1811-1812 congressional debates, the demands for war increased and to support their cause, the war hawks referred repeatedly to the annoyances that the British caused to the United States. The American trade had suffered for too long from British restrictions and there was an urgent need to find an overseas market to revive the stifling economy of the country. They also alluded to the possibility of conquering Canada as revenge for the violent war at the frontier, where Indian chief Tecumseh led raiding campaigns with supplies from the British. On November 5, 1811, U.S. President James Madison called Congress in a special session and talked about preparation for the war. Since Congress was dominated by the war hawks, the war message spread rapidly. 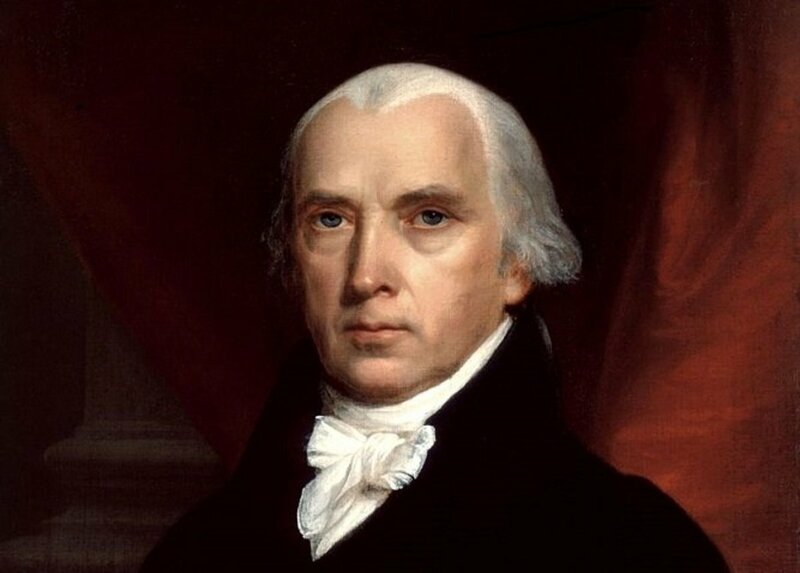 However, only on June 18, 1812, President Madison signed the American declaration of war into law. Difficulties arose right away. First of all, New England opposed the war fiercely because of its commercial, historical, and cultural ties with Britain. Secondly, there were military and financial drawbacks that made the United States unfit for a lengthy war and in fact, the financial preparations hardly took into account the realistic costs of a war. Ironically, Great Britain had already announced the removal of restrictions on American trade, but the news reached the United States too late. Northern Battle of the War of 1812. The beginning of the war was disastrous for the American forces. While attempting a three-pronged attack on Canada, the army encountered numerous problems with its means of supply and communication, while the hopes of finding local support proved futile. On August 16, 1812, General William Hull had to surrender his army after a disastrous attempt to enter Upper Canada. The campaign which was supposed to carry the second attack on the Niagara frontier also faced insurmountable obstacles. In October 1812, an American force managed to cross the Niagara River and attacked Queenstown Heights but was quickly chased back. The third attack along Lake Champlain route was also unsuccessful. If on land the American forces were discouraged by failure after failure, things went differently at sea. In the first year of the war, the American navy managed to win a series of sea battles against the more experienced British. The success of the American sailors restored the nation’s confidence, and was also a consolation for their losses on land. However, most of the sea victories occurred on single-ship encounters, which forced the British to change their strategy. In the spring of 1813, the large Royal navy formed a blockade which made it impossible for American ships to leave the ports. From this point forward, the balance of power changed in favor of the British. On June 1, 1813, Captain Lawrence of the Chesapeake accepted to confront the British Shannon at sea, but he lost his life and Chesapeake was taken over by the British. The American naval forces never recovered after this crushing defeat and until the end of the war, the British navy maintained strict control of the American coastline. The effect of the new blockade was disastrous for private business and government enterprises. Exports fell dramatically in Virginia, New York, and Philadelphia, and economic ruin loomed over the country. Meanwhile, the missions of the American land forces failed to achieve their purposes. For a large part of 1813, the Detroit front brought no luck to Americans, starting with the defeat of General James Winchester and his army by an alliance of British and Indians near River Raisin in southeastern Michigan. Other defeats followed on the same front in the spring and summer. Eventually, with the help of the navy, the United States won control of the lake. An American force under William Henry Harrington chased the British who had decided to retreat, and on October 5, the two armies clashed along the Thames River. The Americans won the Battle of the Thames, and with it, they took control over the Detroit frontier while also dispersing some of the Indians tribes, who had lost their leader, Tecumseh, in the fight. However, Harrison's victory remained a singular event on the Canadian fronts. By the end of the year, the United States controlled some regions of Upper Canada but in reality, compared with the expectations, the progress was very modest. During the first two years of war, the South also saw its share of action, especially as the attempts of the American forces to seize Florida met violent opposition from the Indian population. On March 27, 1814, a campaign led by Andrew Jackson defeated the Creeks in the Battle of Horseshoe Bend. Things aggravated in the spring of 1814, when the British, after almost defeating Napoleon in Europe, decided to concentrate all their strength on the war with the United States. 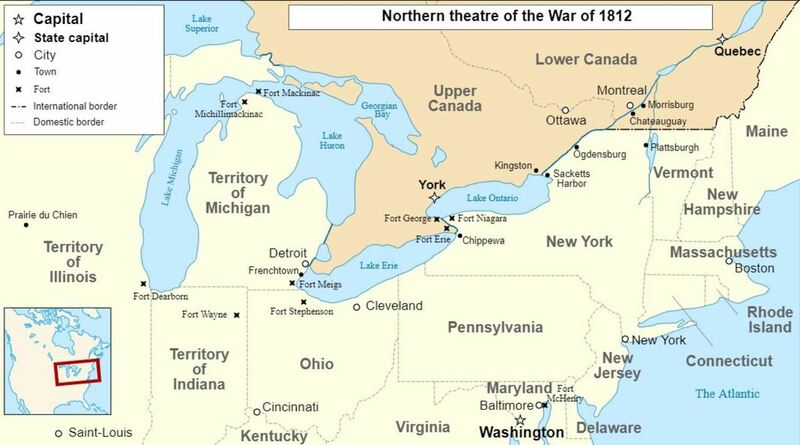 Their initial plan was to attack simultaneously on the Niagara frontier, along Lake Champlain, and in the South. However, by the time the British reinforcements reached the Niagara frontier, the American forces had distinguished themselves already in the area by winning a series of battles. The British soon realized that the resistance on the Niagara frontier was difficult to challenge. The greatest threat for the United States was the planned attack along Lake Champlain, which was supposed to be delivered by a force much larger than what the Americans could mobilize. Fortunately for the American army, the British commander Sir George Prevost and his army never got the chance to attack. On September 11, 1814, an American naval force defeated a British force at Plattsburg Bay, and the loss at sea convinced Prevost to retreat, thinking that the risks were too high. What was meant to be the greatest British attack on American soil was thus never carried out. "The President's House". Cira 1814-1815. by George Munger. 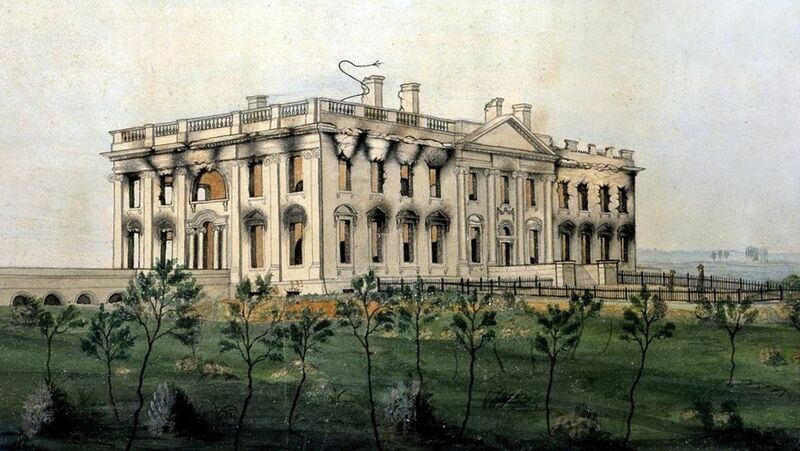 The painting shows the burnt out shell of the President's House after it was nearly burn't down by the British. After their failure at Plattsburg, the British devised a new plan, which caused the Americans the greatest humiliation they had to suffer throughout the war. In the sweltering August heat of 1814, British forces landed in the Chesapeake Bay and moving past American resistance, entered Washington, D.C., and began burning public buildings, including the President’s House (White House). When the British advanced on Washington on August 24, 1814, President Madison retreated North from the city, along with many of the residents. The First Lady, Dolley Madison, planned to move in with friends in Virginia to be safe from the siege. Instead of leaving when planned, she remained behind to supervise the removal of documents and national treasures from the President’s House, including the portrait of George Washington. Mrs. Madison, along with the servants and slaves managed to escape just before the British arrived. Their escape was so close that the British forces, led by Major General Robert Ross, ate the meals sitting on the president’s table and drank his wine. After the President’s House was ransacked fires were set to burn down the mansion. As providence would have it, a few hours later a violent thunderstorm broke out from the hot balmy Washington air and drenched the city, extinguishing the fires that had been set. The British left without resistance as soon as the storm abated and returned to their ships. After the devastation of Washington, the British sailed to Baltimore and mounted a land and sea attack, but a well prepared American force managed to repeal them. It was during the British attack on Baltimore that Francis Scott Key penned the poem "Defence of Fort McHenry", which later became the lyrics for "The Star-Spangled Banner", the national anthem of the United States. Unable to take the city, the British withdrew and set sail for New Orleans. In the summer of 1814, besides the overwhelming pressure of the war, the United States faced severe internal struggles. One of the main reasons for discord was the fact that since the beginning of the war, Federalist New England had been reluctant to provide its share of financial support and volunteers. The silent disagreement turned now into fierce protests, which culminated with the Hartford Convention of 1814-1815, where the matter was discussed thoroughly. However, the Federalists’ attitude during the war shattered their reputation and their party found it difficult to survive afterwards. At the end of 1814, the British decided to send a force towards New Orleans. On January 8, 1815, Commander Sir Edward Pakenham and his army met Andrew Jackson's army, who had already prepared a firm defense. 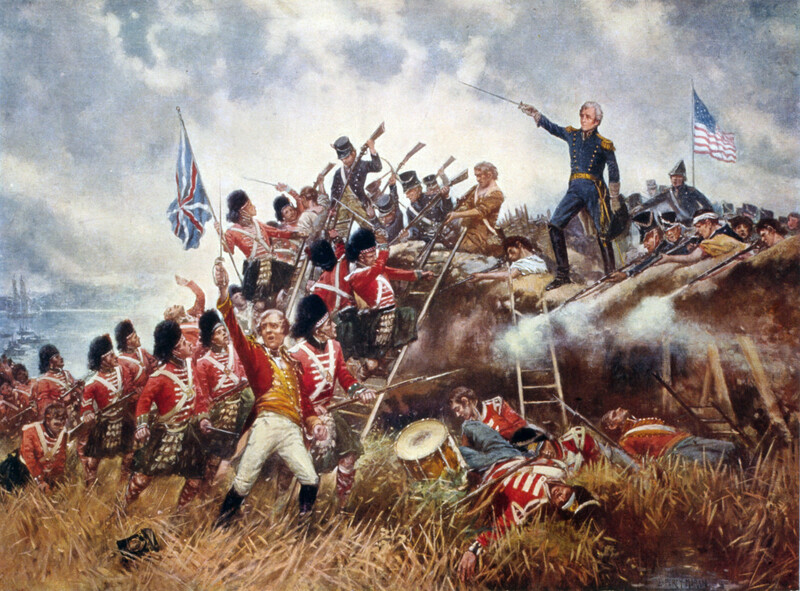 By the time they reached the south of New Orleans, the British became vulnerable to fire and marched directly into it. The battle ended disastrously for Great Britain who suffered 2,000 casualties while the United States suffered fewer than 100. What the troops at New Orleans didn’t know was that a peace treaty had already been signed, meaning that they efforts had no weight anymore. The victory had, however, a strong symbolic value. 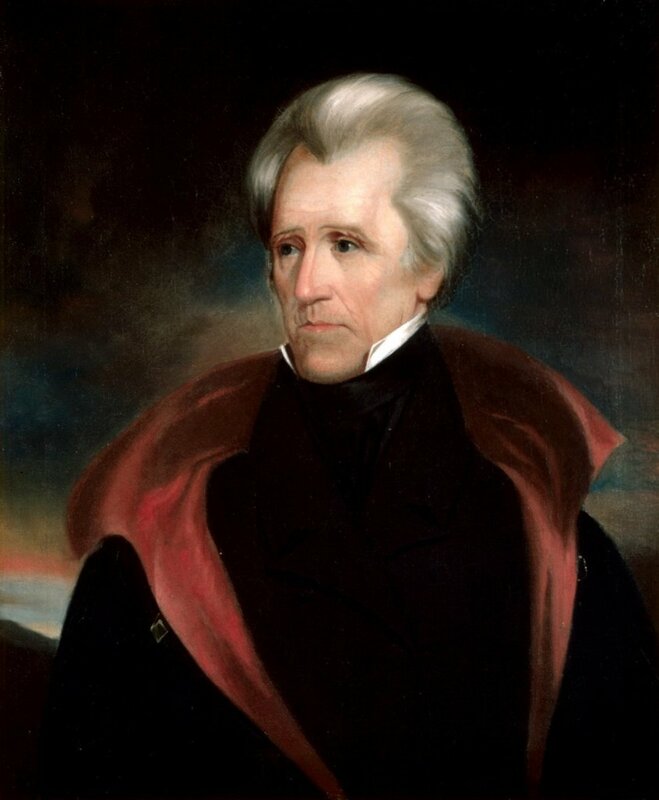 For almost its entire length, the war had been a bleak and at times hopeless undertaking for the Americans, but the Battle of New Orleans completely restored the patriotic belief in the glory of the United States and brought hero status to a man the would become a president, Andrew Jackson. Battle of New Orleans: General Andrew Jackson stands on the parapet of his makeshift defenses as his troops repulse attacking British. 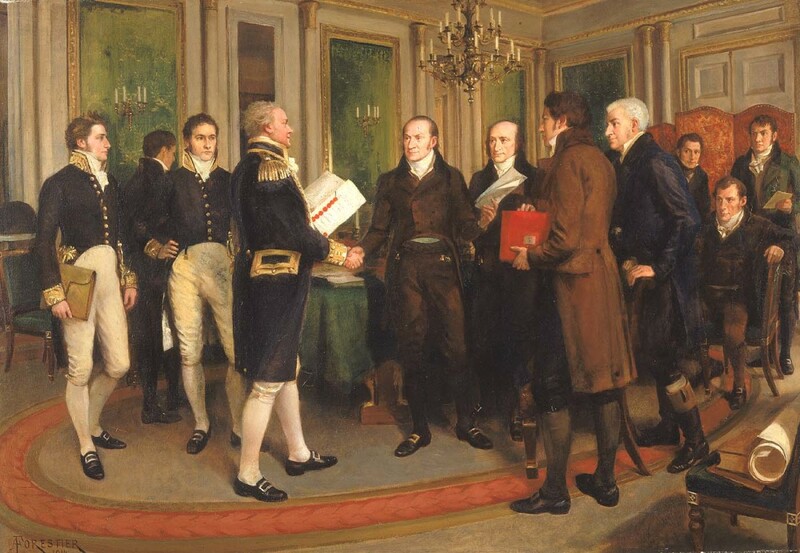 On December 24, 1814, Great Britain and the United States signed a treaty in the city of Ghent, United Netherlands, in which the two parties decided to end all hostilities. John Quincy Adams lead the negations on behalf of the United States. The treaty was ratified by Great Britain three days later but arrived in Washington only on February 17, where it was also quickly ratified. The treaty officially ended the war. According to the terms of the treaty, the United States had to return to the prewar boundary in Canada but gained fishing rights in the Gulf of Saint Lawrence. The maritime disputes that caused the war were no longer valid because Great Britain had already removed restrictions. Although the Americans did not gain all the things for which they had gone to war, the peace was a unanimous reason for joy after years of economic and military struggles. 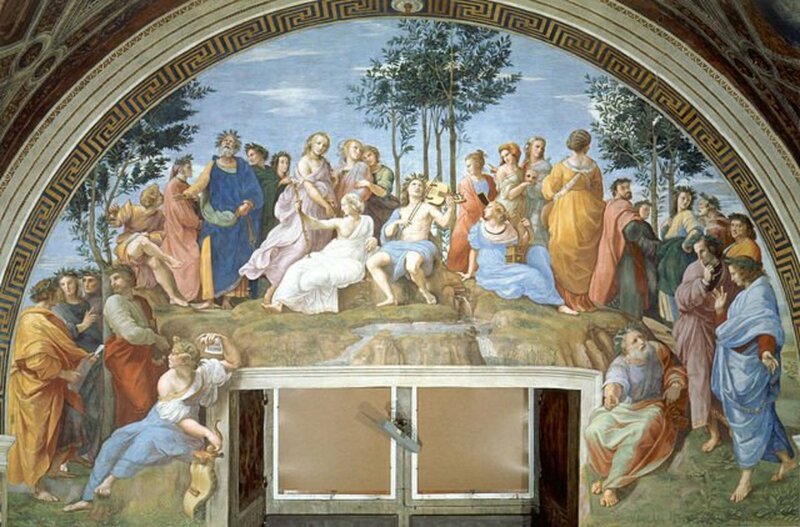 Only the ending of the European wars made peace possible in the New World. Overall, the War of 1812 freed the United States from external pressure and allowed the country to focus on local expansion in the years that followed. Impressments stopped and the Europeans agreed to not interfere with neutral trade anymore or harass American merchants, which made way for economic development. Moreover, American nationalism gained depth and breadth, and Americans became much more optimistic about the potential of their country. Not only that Great Britain stopped posing any threat, but the Indians also stopped being a serious threat. After being defeated in several battles and seeing their British allies losing their aura of prestige, the tribes weren’t able to regain their forces and stop American westward expansion. Subsequently, the American settlers found that the paths to the west were wide open and after 1815, the western expansion grew significantly. Especially due to Jackson’s campaign against the Creeks, large areas in Georgia and Alabama were opened for settlement. Perhaps the most tragic story of the war of 1812 was that of the fate of the Indians. The death of their great leader Tecumseh was a double blow to the natives as they not only lost their leader but also lost their political voice in resolution of war. Having their hopes dashed of establishment of an Indian homeland in Canada, the tribes continued their decent into marginalization and poverty. The Signing of the Treaty of Ghent, Christmas Eve, 1814. Adams, Henry. The War of 1812. Cooper Square Press. 1999. Borneman, Walter R. 1812: The War that Forged a Nation. Harper Perennial. 2004. West, Doug. America’s Second War of Independence: A Short History of the War of 1812 (30 Minute Book Series 29). C&D Publications. 2018. War of 1812. United States – United Kingdom History. Encyclopedia Britannica. Accessed April 6, 2018. After your comment, I went back and did some reading and beefed up the section of the Hub "The Burning of Washington, D.C." to make the story more complete. BTW, it was the Secretary of State James Monroe that jumped in and helped with the defense of Washington as the British were advancing on the city. Monroe had served in the Continental Army under General Washington. Madison was a frail small man and was too sickly to serve in the army during the Revolutionary War. However, Madison has the distinction, with the exception of Lincoln, of being the only sitting president to be Commander-In-Chief on an active battle field. I hope that better explains things. Thanks for the good comments. Thanks for the feedback. Always good to hear your thoughts. I am going to have check on if Madison actually took control of the military in an active way during the sacking of D.C. I thought he was out of town at the time (?). His wife, Dolley, was responsible for saving some of the treasures of the Executive Mansion just before the British arrived. Great article, Doug. The War of 1812 was an interesting event in our history. I remember watching a program that said James Madison truly acted as Commander-in-chief, taking control of the artillery during the battle for Washington, D.C. I think he was the last president to actually lead the military in that way. When I was young, my dad was a fan of the old Johnny Horton song, "Battle of New Orleans," and he had taught us about the war of 1812 when we were kids. It helped that the song was fun. It's unfortunate what happened to the Indians, but luckily, we have learned from some of our mistakes. We are America; we make mistakes and remain united. Thanks for taking me through the, War of 1812, Doug. No war ever seems to have a winner. Oh yes, a winner is declared, but the consequences are so devastating that it really takes a toll. It is sad that the Indians were the big losers from the war. Tecumseh was working to organize several tribes into a cohesive group so they could bargain with the British and Americans for land and rights. 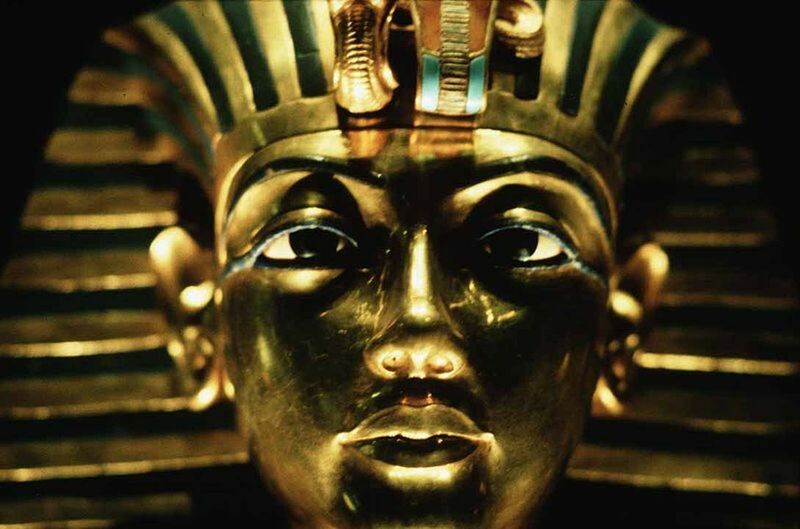 When he died, the tribes lost their voice. Tecumseh is an example of how one person can be so key in the course of events that when they are gone things fall apart. There are always winners and losers in a war and it is sad that the Indians lost but they can look back to the greatness of their great chief Tecumseh. Those battles in the Lakes were quite interesting.